Using drones during Flood events. New rules for drones around airports were introduced by the CAA in March 2019, this was the second such change to the air navigation order in this respect within 12 months. Unfortunately, the legislation changes have made no distinction between commercial drone operators with permission and insurance, and hobby drone pilots. Previously commercial drone pilots in possession of a Permission for Aerial Work, (PfCo) from the UK CAA were allowed to fly drones with a mass of under 7kg in and around airports without requesting permission. That said most operators did inform the airport air traffic control, (ATC) as this was deemed to be best practice and contributed to air safety. Most members of the public are not aware that the majority of commercial and hobby drones have internal GPS database, (Geofence), which restricts the flights of drones in and around airports. Typically these restrictions were centred on the Air Traffic Zone, (ATZ), at airports. 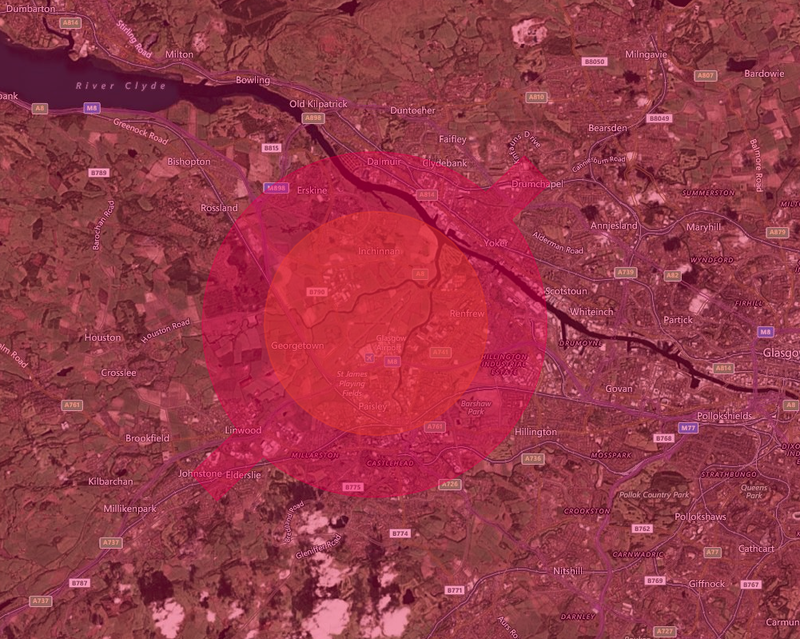 – The Aerodrome Traffic Zone: A 2 or 2.5 nautical mile radius ‘cylinder’ around the aerodrome, extending 2000 ft above ground level, centred on the longest runway. 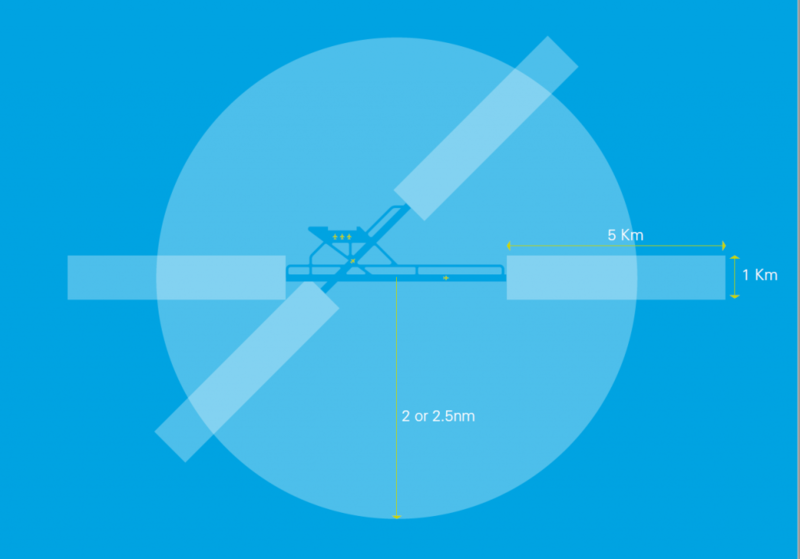 – Runway Protection Zones: A rectangle extending 5Km from the threshold of the runway away from the aerodrome, along the extended runway centreline, and 500m either side- also to a height of 2000 ft above ground level. – Additional Zones: In the case where the 1Km boundary of an aerodrome extends beyond the Aerodrome traffic zone, and so would not be protected by it, the flight restriction zone will include a ‘bump’ (the airfield boundary + 1KM) to protect this part of the aerodrome. Although most commercial drone operators would inform the local ATC when flying a drone near an airport previously, they did not require their express permission to fly. With the introduction of FRZ’s and the changes to the Air Navigation Order, (ANO), commercial drone operators now require the explicit permission of ATC before a flight can be made. The new FRZ’s extend far beyond the old ATZ’s covering much larger areas, both around the airports but also in-line with the approach and take-off. As a result of these changes commercial drone pilots are now experiencing problems gaining the necessary permissions for flights that they previously undertook legally and safely. The requirements to gain the appropriate permissions varies by airport and operator. Where NAT’s supply the ATC functions they are using the Non Standard Flight, (NSF), permissions process initially, (a processes that can take up to 28 days), then on the day of the flight the permission of ATC is required. At other airports not managed by NATs, local ATC are either outsourcing this process or giving a blanket NO to drone flight requests, unfortunately an alarming amount are saying NO. Some suggestions have been made that this is down to resources issues, but likely politics are involved as ATC get no additional monies to manage these requests. The changes have allowed ATC to now say NO, even when the flights could be made safely. There has been much confusion regarding the process that commercial drone pilots must undertake to gain permission at some airports, this coupled with many just responding with a resounding NO, has resulted in concern from many drone pilots about their ability to undertake existing and future business in and around airports. These new rules were introduced in part as a knee jerk reaction to the incident at Gatwick. The only result so far is that they have restricted the safe and legal operation of commercial drones. Criminals don’t care and won’t take notice of additional drone legislation, those wanting to use drones for nefarious purposes will continue to do so no matter what new laws are introduced. Previously the UK had been a world leader in developing drone legislation and frameworks for the safe use of drone within its airspace, with the US lagging far behind. In recent months this role has been reversed, we hope the recent introduction of FRZ’s is not a sign of things to come for the fledgling UK drone industry. Whilst post Gatwick there will be little sympathy for Drone Operators with regard to these issues, many commercial drone pilots are concerned about the backlash from the public as a result. Over the past few months there have been numerous reports of pilots being assaulted both physically and verbally. The industry would like to see the media and regulators differentiate more between legal and safe drone operations and those operating illegally. Drones bring several benefits both from a safety perspective, but also commercially. About the author: Craig Jump is leading drone consultant, with over 7 years drone / UAV flying experience. He holds UK CAA permissions for fixed and rotary wing drones and is a UK CAA NQE Instructor and flight assessor. He is Security Cleared, Disclosure Scotland Checked and provides anti drone and drone security consultancy services. Is 2019 going to be a difficult year for UK Drone Operators ?